Avr 2016: Invited to the opening party of Ba&Sh in Geneva. Avr 2016: Invited to savour seafood from Italy at the Dolder Grand in Zürich. Avr 2016: Invited to the Diesel Store in Zürich for the “Denim Master Studio” (customization of a selected Diesel piece). Mar 2016: Invited to BaselWorld with (Tag Heuer, Zenith and Ice Watch). Mar 2016: Invited to the launch of the new Adidas NDM sneakers collection. Mar 2016: Invited to the launch of the new Caudalie collection. Mar 2016: Featuring 3-days detox juices with DetoxDelight. Mar 2016: Invited to press day of International Motorshow Geneva with Tag Heuer. Mar 2016: Invited to a Weekend in Style, at the Royal Savoy Hotel in Lausanne. Mar 2016: Invited to participate as Fashionboho sells her clothes with the app Tradono. Feb 2016: Invited to the launch of the new Estee Lauder collection. 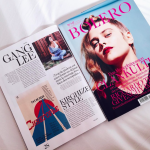 Jan 2016: Featured in the printed issue Dec/January of the Magazine Bolero, with the blog, Fashionboho. Nov 2015: Invited to the press release of the Tag Heuer Ski with Stöckli at the Stöckli manufacture. Nov 2015: Invite to the private dinner with Diesel for the release of their new collection, in Zürich. Nov 2015: Invite to the opening to the Baltho Küche&Bar and spent a night at Marktgasse Hotel, in Zürich. Nov 2015: Invite to the re-opening of the boutique Tally Weijl, in Zürich. Oct 2015: Invite to attend the Swiss Indoors in Basel with Moet&Chandon. 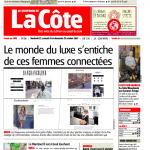 Oct 2015: Featured in the LaCôte Magazine, on both digital and print, with the blog, Fashionboho. Oct 2015: Invite to the press release of H&MXBalmain collection, in Zürich. Oct 2015: Invite to the launch of the brand Chlorys, a skin care and cosmetics Maison, from Geneva. Oct 2015: Invited to the visit Tag Heuer HQ with the new Ambassador and fame DJ, Martin Garrix, in La Chaux-de-Fonds. Sep 2015: Invited to the press release of the new Lee Jeans collection, in Zürich. Sep 2015: Invited to attend the fashion event ModeSuisse Edition8, in Zürich. Sep 2015: Invited to the release of the new Lush collection. Sep 2015: Invited to the launch of the new Estee Lauder collection. Sep 2015: Invited to the first Kiton store in Switzerland. Aug 2015: Invited by H&M for a yoga session with Luisa Rossi for the new H&M Sport Collection release. Jul 2015: Blogger part of the swiss Lee Jeans community. Jul 2015: Invited for the launch of Moët&Chandon MoëtIce/Imperial, in Geneva. Jul 2015: Montreux Jazz Festival with Globus. Jun 2015: Invited to try and spent a lovely time at the spa of the Grand Hotel Kempinski Geneva. Jun 2015: Invited to ModeSuisse Special Edition 8 Fashion Show at the Swiss Pavilion, in Milan. Jun 2015: Invited for the launch of the new collection of the swiss cosmetics brands La Prairie. Jun 2015: Invited to Art Basel 2015 as a press reporter. Jun 2015: Attending the famous and prestigious St John’s College May Ball in Cambridge (Cambridge University). Jun 2015: Discovery of the Orn Perfume Brand at Bongénie Grieder in Geneva. May 2015: Reporter for the Expo 2015 Milano. May 2015: Invited for the new restaurant La Bottega Trattoria, in Geneva. May 2015: Invited to Sylt, Germany for the weekend with Maserati for attending the Maserati Polo Tour partner with La Martina (Juliuy Baer Beach Polo World Cup Sylt). May 2015: Discovery of the Atelier Flou perfume Brand at Globus in Lausanne. May 2015: Invited to the gastronomic lunch between bloggers at the RasoiByVineet at the Mandarin Oriental Hotel. May 2015: Invited to the Davidoff Tour Gastronomique at RasoiByVineet Restaurant at the Mandarin Oriental Hotel. Apr 2015: Report blogger for the Caprices Festival and MDRNTY. Mar 2015: Invited to the famous Cocktail de la Tulipe 2015, at the Mandarin Oriental Hotel in Geneva, for its 65th Anniversary Birthday. Mar 2015: Invited to BaselWorld 2015 as a press reporter. Feb 2015: Invited to assist to the famous London Fashion Week at the Hunter Original & FelderFelder‘ Shows. Feb 2015: Invited to the Cocktail Press with the Chef Moha Fedal at the Mandarin Oriental Hotel in Geneva. Feb 2015: Invited to assist at ModeSuisse in Zürich. Jan 2015: Seen in Romande Magazine in the Street Style section. 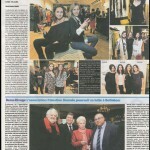 Jan 2015: Invited for the launch party for Romande Magazine. Nov 2014: Invited to attend the Mercedes-Benz Fashion Days in Zürich. Nov 2014: Styling and shooting of two luxurious Pyjamas, from BlueLemon, at the Hotel Storchen Zürich. Nov 2014: Interviews and reportage about my craziness love for shoes, with the Radio Television Swiss, Link to discover Here. Dec 2014: Shooting for the collection A/W14 with Gant.